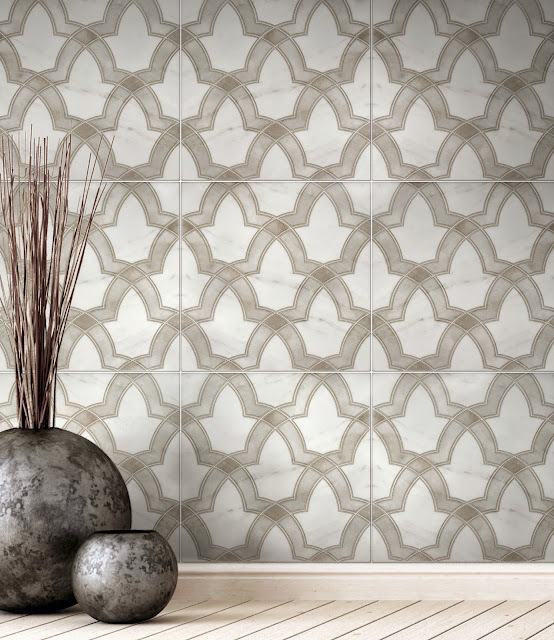 The Duo Pattern is our second example of modern patterns in the Artisan Stone Tile Carrara line. Duo’s Nickel color scheme highlights this kitchen’s simple steely and minimalist styles. The grey and pearl tones create a 3-dimensional depth on the kitchen backsplash. Duo’s diagonal shifts and the alternating colors are distinct to this pattern creating a unique feeling of movement along its surface. I particularly enjoy this backsplash because of the green and red colors that draw the eye. This example really shows off how the Nickel monochrome color pattern can bring out the other colors around your kitchen. Another alternative is our Glacier Blue color scheme. Glacier Blue is named after its nearly translucent usage of blues just like a glacier. The blues nearly fade back to the natural Carrara stone as you approach the center of each diagonal line. Though it departs from the monochromatic scale of the Nickel pattern, it retains the subtlety of its colors. Duo is offered on 6” x 12” Carrara stone.